it’s been almost 4 months since i started taking kimono lessons. lately, due to an unbearable summer heat in tokyo, my teacher & i came to an agreement that we use a “yukata (浴衣),” a casual kimono-like garment made with cotton, for my practice. those who have been to some japanese “onsen (温泉), hot spring, must know what a yukata is. originally, it is something you put on after taking a bath, in the evening, so is meant to be very casual. nowadays, yukata is very popular and worn frequently for summer festivals and fireworks. yesterday, i had a weekly kimono (well yukata for now) class in the afternoon, and came home in my yukata i had put on during today’s lesson. 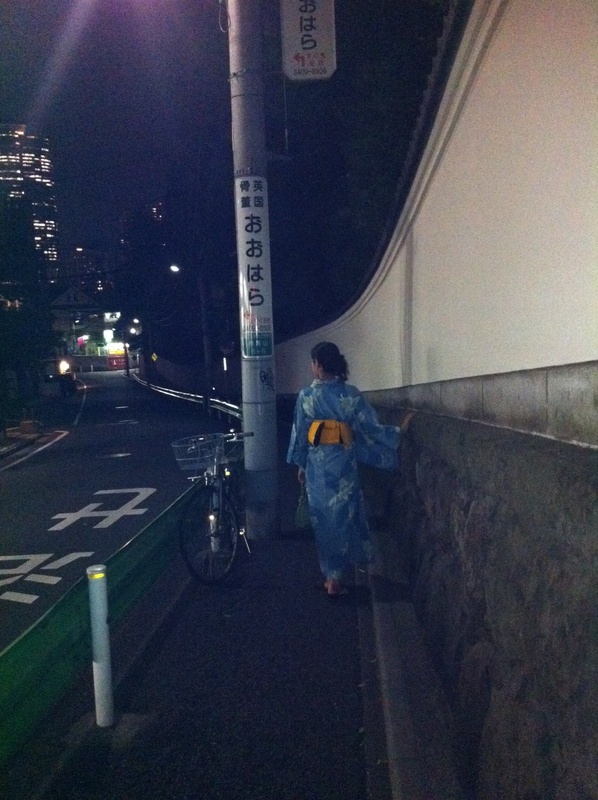 as part of the exercise, my teacher encouraged me to go out in yukata to gain my confidence. she even gave me some tips how to walk in such way to make me look as a typical, somewhat ideal japanese woman (“put some weight on your big toes!). 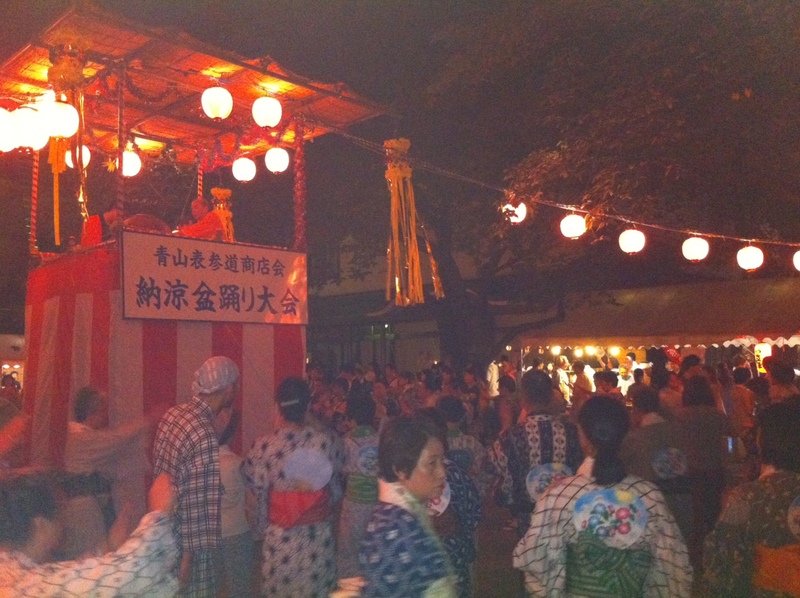 so after the lesson, i took my husband along to an annual summer festival at our neighbourhood temple. at the festival, there were a few food stalls selling “yakisoba (焼きそば),” stir-fried noodles, “kakigori (かき氷),” shaved ice with colourful syrup, “ramune (ラムネ),” sweet lemony soda in a greenish transparent glass bottle, etc… In the middle of the temple, there was a stage where a few people were playing Japanese traditional music with taiko drums for everyone to dance “bonodori (盆踊り),” bon festival dance. it is not a difficult dance – pretty much self-explanatory once you see it – and you can dance in your yukata too. it’s a repetition of several body movements, and you go around the stage in circles, again, and again, and again. to my surprise, it was extremely crowded at the temple. kids were running around, people dancing, eating and drinking, boys and girls fishing for their potential dates… many people dressed in their traditional costume, myself included, and i strongly felt unaltered elements of traditions, through its music, noise, smell, crowd, lights, steamy air, heat…. in the heart of this modern, cosmopolitan city, i thought as if we had time-travelled to a different era. in yukata, i felt good. wearing it gave me an amazing emotional comfort, and to make my teacher very proud, more self-esteem for who i am. i’d love to keep trying to preserve this. to the next generations, for years and years to come. for humans, blood relationship can be stronger than any other relationships you can have. even if you look totally different or act entirely opposite, you are connected, deep down with your roots, with an unavoidable biological fact – you share the same blood. my dear little sister and i can be the perfect example of this theory. we have the same parents and background and grew up together. however we don’t really share anything in common when it comes to our personalities – our interests, our behaviours, our thoughts, our values, our expertise, our ideologies and what have you… my sister has never been abroad, whereas i have been all over. she is a loving mother of 2 children, 8 and 6 year olds, has rarely exposed herself to the competitive world of capitalism. i, on the other hand, was quite focused on my professional career, and had never really thought of starting a family until i got married recently. i am wondering if this theory can apply to food as well. as one of many examples, i would like to propose a bond between beef stroganoff and raspberry muffins. 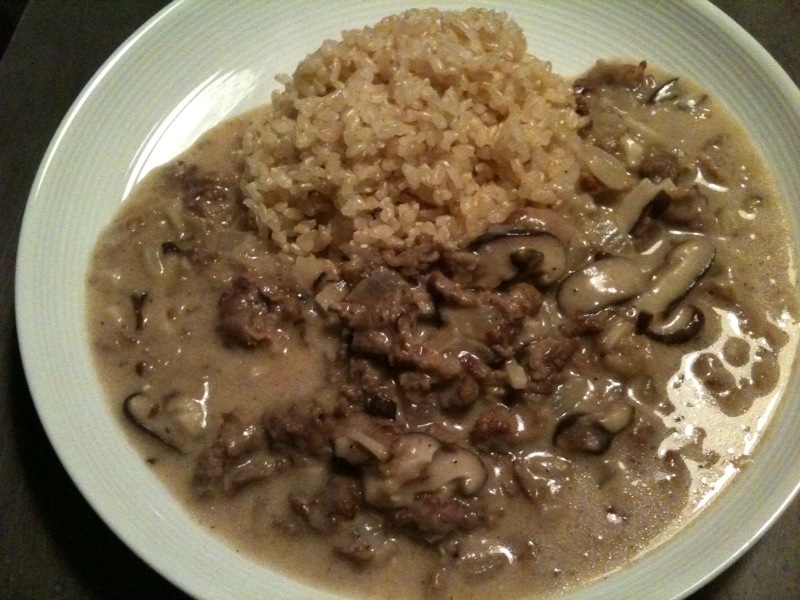 last night i cooked beef stroganoff for dinner, which required sour cream as kind of like its taste enhancer, and was left with quite a portion of sour cream unused. 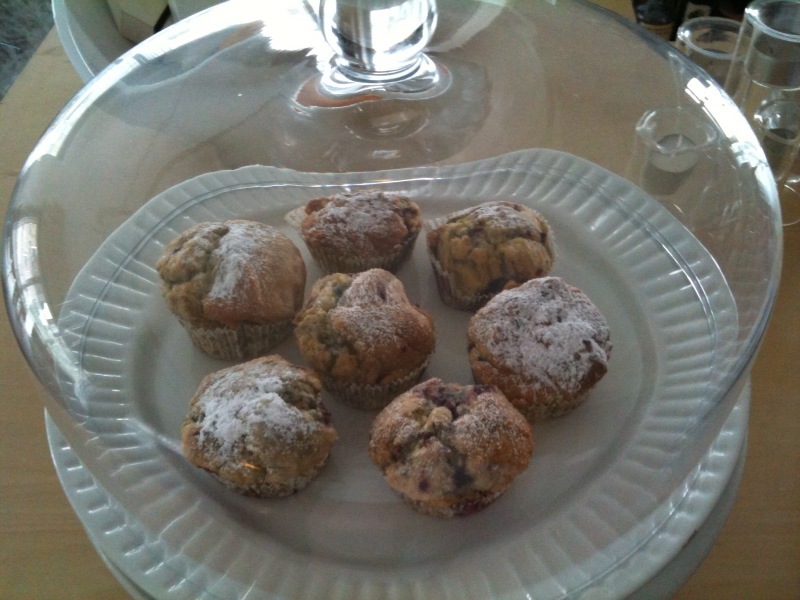 after the dinner, i looked up some recipe ideas ferociously on the internet, and decided to bake raspberry muffins so that i wouldn’t have to waste the sour cream. not to mention this experiment resulted in a big success, fulfilling the sense of pride in myself (that i did not waste anything) and the appetite of my husband with a sweet tooth. as odd as it may sound, in my mind the beef stroganoff and the raspberry muffins from last night are blood related brother and sister, who turned out to be very different in their appearances and tastes, but make me happy nonetheless. to some degree, to be a parent must be quite similar – you love your children no matter what, no matter how different you are or how different you look. i know my parents love my sister and i equally, however different we are. after all, we are their creations, who are inevitably connected with their combined histories. 7. add salt & pepper to taste, and cook for another 10 minutes or so until the liquid become thicker in texture. 9. bake in 180C oven for 20 minutes or so. it is an oven dish, and it may be meant for cold weather. on the contrary however, for the past few weeks it has been boiling hot in tokyo, now that the rainy season is over. to make the matter worse, we have been trying to save energy all over japan due to the nuclear power plant failure in fukushima back in march. this means we try not to use an air conditioning during the day as much as possible and instead use only a small electric fan (uses much less electricity). in such heat i usually loose my appetite, but somehow, the other day, i craved for the taste of chicken marbella. maybe the bright sunshine may have reminded me of spain, which may have reminded me of juicy green olives, which reminded me of chicken marbella. 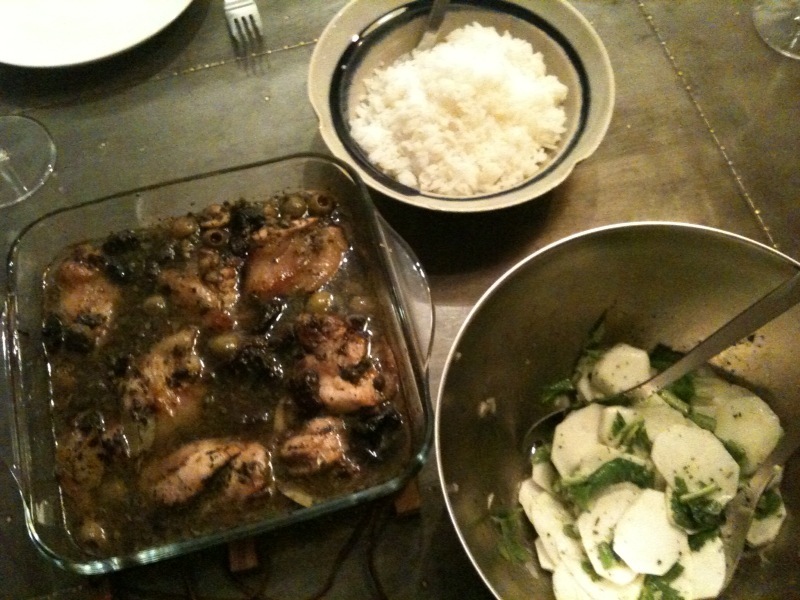 what is so special about chicken marbella is its marinade. 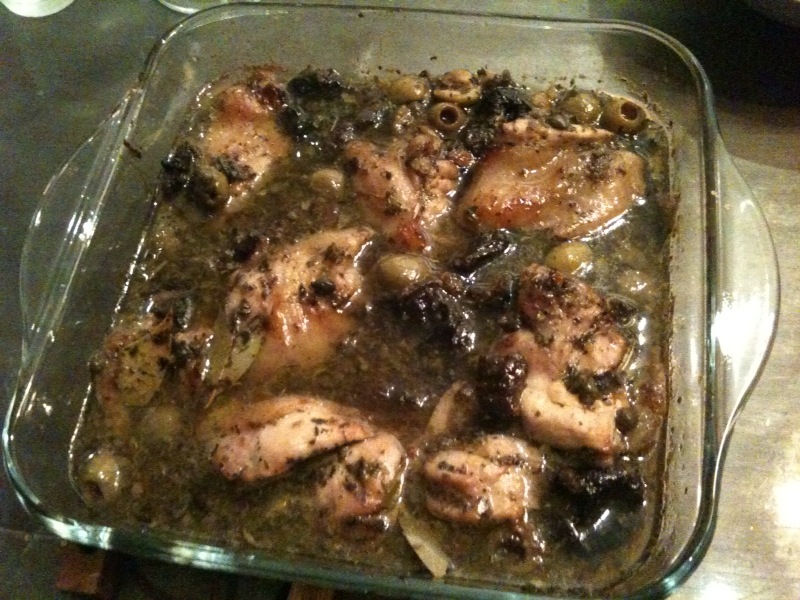 it is made with olive oil, red wine vinegar, garlic, oregano, prunes, green olives and capers. after marinating chicken overnight in this marinade, it magically transforms the plain chicken to something truly delicious and memorable, offering an amazing kick & depth in taste and richness & moisture in texture. 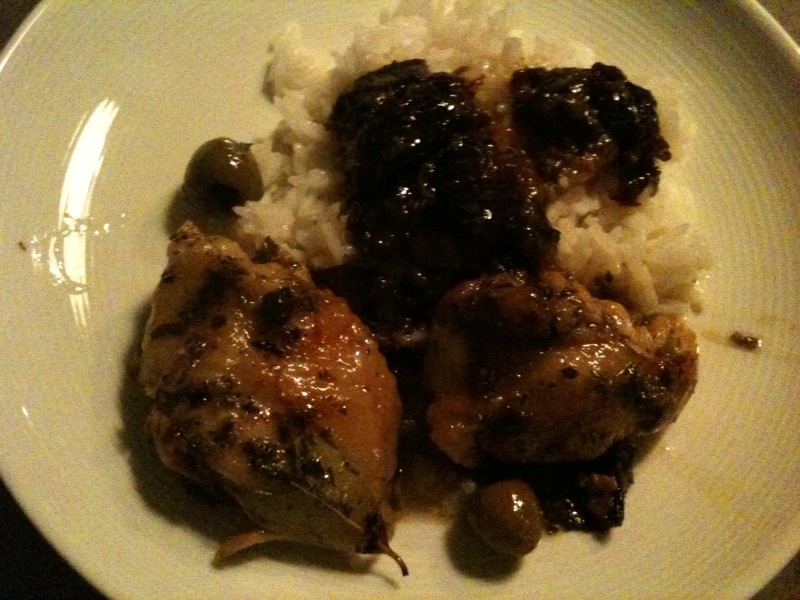 and another nice thing about chicken marbella is that it is super easy to prepare – mix the marinade, marinate the chicken overnight, and put it into the oven for 40 – 50 minutes the next day – boom! it looks so dazzling and splendor, perfect for a dinner party. its taste gets even better the following day – the marbella sauce gets a bit thicker and tastier. make sure to have some leftovers so that you can enjoy it once again!